Awarded Ireland’s Best City Hotel in 2017, Montenotte Hotel is the perfect base to explore the rebel city. 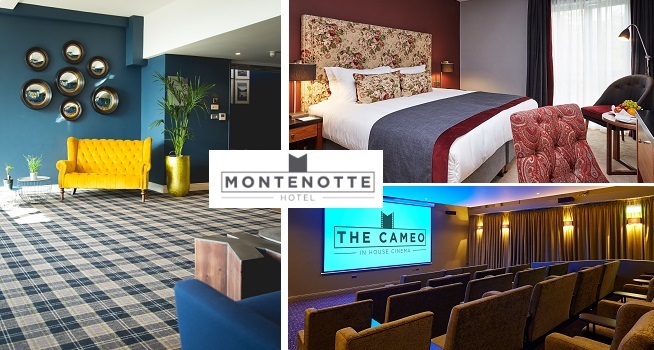 Modern, stylish and chic, the Montenotte is Cork’s freshest boutique hotel and a wonderful spot for a girl’s weekend, couples getaway or family break. Relax in your comfy surroundings, take in an evening movie at the in-house Cameo cinema or make use of the leisure centre, featuring a 20 metre swimming pool, sauna, steam room and jacuzzi. TheTaste and The Montenotte Hotel are giving you the chance to experience a 2 night escape with breakfast and dinner on one evening with a glass of Prosecco for only €325. – A 3-course Evening Meal in Panorama Bistro & Terrace on one evening of your choice. Looking out over the bright lights of Cork City is the Panorama Bistro, which offers a tempting menu dotted with locally sourced ingredients and the finest produce from artisan producers. Panorama is truly a unique dining and social experience, newly decorated with a chic interior. – Dinner is on one night only and must be pre-booked in the restaurant and is based on a set dinner menu. – All offers are subject to availability, terms and conditions apply. Offer does not apply to 24th to 31st December 2018 inclusive.